Kelly Saunders strokes Chester, who spent most of his life in a stall and could barely walk when he arrived in Booksville. Photo by Anne Berleant Order prints of selected PBP photos. Inside a fenced area on an old Brooksville farm, three horses canter, kicking up snow as they trot over to greet their caretakers. 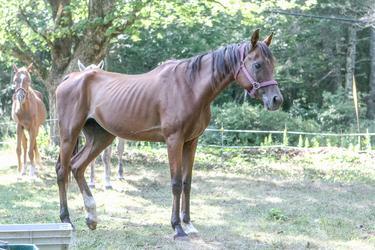 Well-muscled, with gleaming coats and alert eyes, Birdie, Tommy and Chester are far from the starving, spiritless horses that stepped off a trailer one foggy August night after a long drive from Texas. Kelly Saunders, who started Bagaduce River Equine Rescue, had bought them from a Texas kill pen that sells horses for slaughter, after which they had to be quarantined for two months before they could travel. “In a kill pen, horses don’t sleep. If they’re not trying to eat they’re trying to survive,” Saunders said, sitting at her kitchen table with her mother, Edna Grindle, and Mary Cockburn, who both lend their time and effort to Saunders’ newly incorporated nonprofit. Bur first came Blossom and her baby, who Saunders found at a western Maine rescue in 2016. “I always wanted a donkey, so I went and got them,” she said. 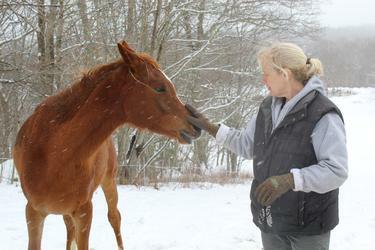 After a home was found for Blossom’s baby, Saunders rescued a mare named Honey and her colt, with the idea that Honey would keep Blossom company. “She was a sweet, sweet mare,” Saunders said. “She was only here to end her life happily.” A home was found for her colt, but Honey, who arrived with a untreated broken leg that had fused on its own, had to be put down after re-injuring the leg. That left Blossom again in need of company. Saunders didn’t plan on rescuing three horses but while scrolling through the Kaufman Kill Pen website, she saw Birdie, a mare who was “a rack of bones, so I pushed the [purchase] button,” and then did the same for Tommy and Chester. “Mom said, well, I think your father would do it,” Saunders recalled, as her mother nodded her head. After all, horses were part of Saunders’ life growing up in Brooksville. The kill pen charges by the pound, and the three horses each cost from $575 to $800. But they were too starved to safely transport from Texas to Maine, so the expenses mounted from first quarantining the horses in a less-than-honorable facility in Texas until Saunders found someone willing to “break them out” and transport them to Maine. Cockburn, a Penobscot resident Saunders met while working at Maine Coast Animal Hospital in Blue Hill, helped from the beginning. 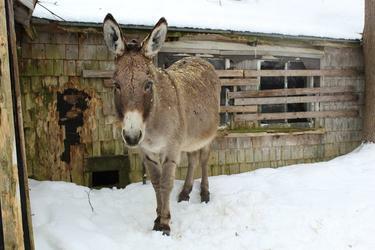 “I came to visit the donkeys and it went on from there,” Cockburn said. “I would not have done it if it wasn’t for Mary,” Saunders added. For Birdie, Chester, and Tommy, who stepped out of the trailer in late summer barely able to walk, Saunders plans to find permanent homes, while Blossom will stay. She formed Bagaduce River Equine Rescue as a 501(c)(3) nonprofit so she could write off her expenses and “people would be more willing to donate.” Over $6,000 came in to help with rescuing Birdie, Chester and Tommy, while ongoing costs are about $25 per day. “Our mission is—because it’s just us taking care of them and we fell in love with them—they’ll never go in the system again,” Saunders said. Read more about Blossom, Tommy, Chester and Birdie, and Bagaduce River Equine Rescue at bagaduceriverequinerescue.weebly.com and on Facebook: Bagaduce River Equine Rescue. 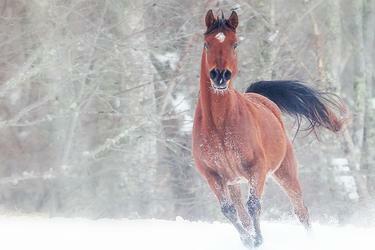 Seven-year-old Chester plays in the Brooksville snow months after being rescued from a Texas kill pen. Birdie and Chester arrive in Brooksville in August, and have each put on over 300 pounds since then. Blossom arrived in 2016 and will stay at the Brooksville farm for her natural life.